Daniusoft DVD Audio Ripper can rip DVD audio to MP3, AAC, AC3, WMA and M4A. It can convert DVD to MP3 Ripper in a fast speed and lots of powerful editing functions, so that you can enjoy your music on all popular MP4/MP3 players like iPod, iPod nano, iPod shuffle, Zune, PSP, iPhone, iRiver, Archos, Creative Zen etc. It provides you rich options: rip DVD audio clips from your DVD movies , set audio bit rate and sample rate. This amazing DVD Audio Converter provides you rich options: rip DVD audio clips from your DVD movies , set audio bit rate (from 32 Kbps to 256 Kbps) and sample rate. 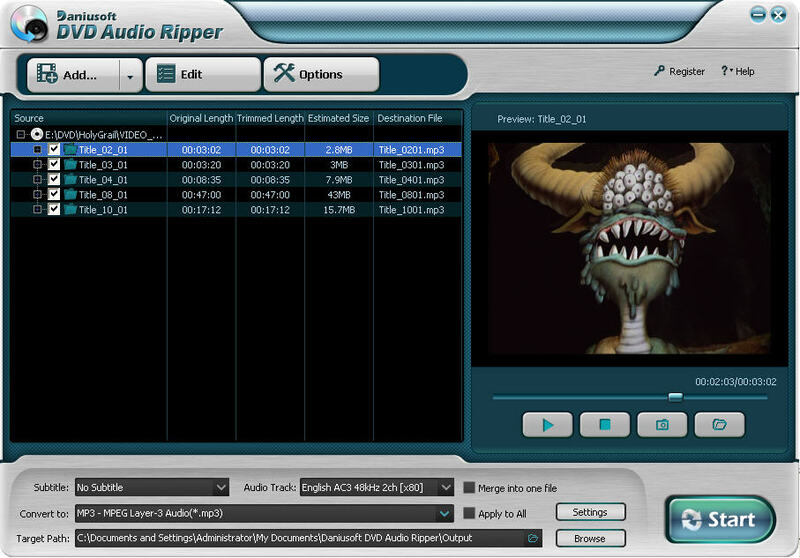 This DVD Audio Ripper has a concise interface which let you rip DVD Audio very ease even for the first time. Just free download it to have a try! Qweas is providing links to Daniusoft DVD Audio Ripper 2.1.0.13 as a courtesy, and makes no representations regarding Daniusoft DVD Audio Ripper or any other applications or any information related thereto. Any questions, complaints or claims regarding this application Daniusoft DVD Audio Ripper 2.1.0.13 must be directed to the appropriate software vendor. You may click the publisher link of Daniusoft DVD Audio Ripper on the top of this page to get more details about the vendor.